Poor Law, Toys Or Real, You Choose!!! Here is the BUT, are these Real or are they Toys, Kids think that they are toys because a state passed a law about toys, they had to be marked different from real guns in bright colors, but that is not so. Now what do you think? Is this some thing that should be sold when kids think these are toys because an other law was passed before they checked out any like usual, it just shows that these people are not Educated enough to make good decisions, good example, WHY is this Country going down in flames, is it because these people have no idea what they are doing, I thought they went to College to get an education so they could run a Country or a Company, well they can not do either. WELL THEY ARE NOT A TOYS, THEY ARE REAL, RIGHT OUT OF THE BOX. They are made right here in the United States. There is probable more to the story, read between the lines, who is going to benefit. Hamilton County Sheriff Jim Neil said it’s “a scary thought” that guns would be painted to mislead police. The bill, introduced Monday by Rep. Alicia Reece, would require all BB guns, air rifles and airsoft guns stand out in color or have prominent fluorescent strips. The Cincinnati Democrat named the bill after 22-year-old John Crawford III, who was carrying an air rifle this summer in a suburban Dayton Wal-Mart store when he was fatally shot by police. Police said they thought Crawford had an assault rifle. Last month, a 12-year-old boy carrying a pellet gun in Cleveland was fatally shot by police. The legislation was modeled after a California law. Several other states and cities have similar laws. Some opponents of the bill have expressed skepticism about whether such measures would be effective in preventing fatal shootings, and some have suggested that criminals would try to disguise weapons to cause police to hesitate. The sheriff said his office wouldn’t get into the debate over the bill, but would provide some facts about the arrest. 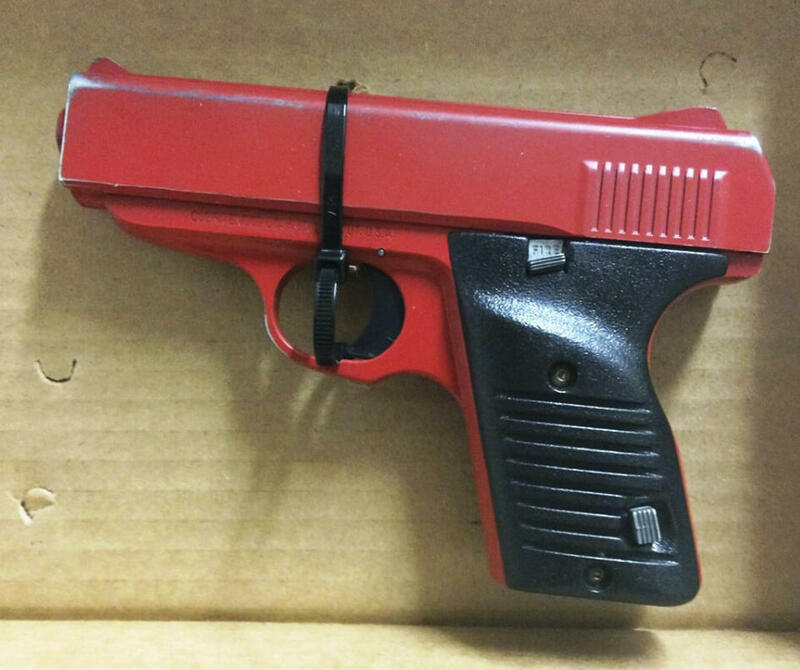 “And the fact is right here in Hamilton County, we arrested a dangerous individual who we believe purposefully painted a loaded handgun red to mislead law enforcement into thinking this was a toy gun,” Neil said in statement.